First up is the green to violet blue pigment. This shows two coats over black with photos taken in the sun. This one starts off green. 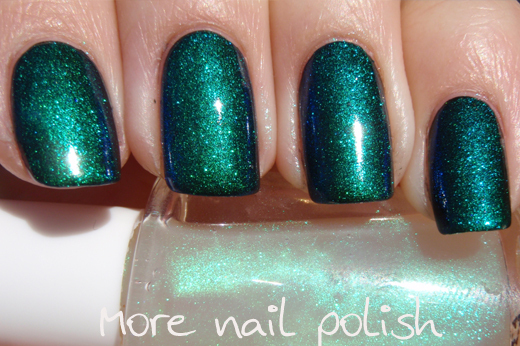 The below shot was taken indoors and shows the polish being a very strong duochrome with blue on the sides and green in the centre. Back in the sun at a different angle you see the green shifting to blue. Now here is my first ever youtube video. It's not edited so there is ambient background noise and maybe a cat meowing, but you get the idea! But I just wanted to try show the colours changing in real life. 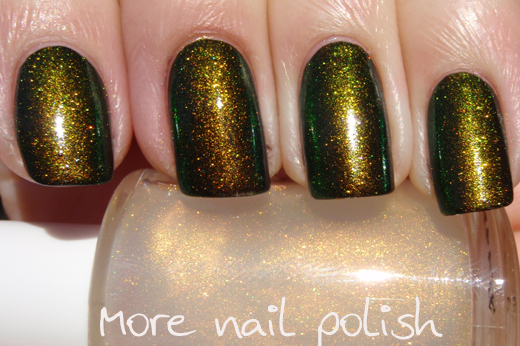 Next up gold to green - This one looks exactly like my Avon Colour Morphing top coat. Exactly I tell you. Not just distant cousins, or sisters, these two are twins! It starts off a bronzey gold with mossy green undertones. Spinning on the spot it gets greener and greener (and I get dizzier and dizzier). And finally the turquoise blue flash at the end. Another video in attempt to display the colour changing in real time. Finally Copper Red to green. Now just like Kang I say "we must move forward, not backward; upward, not forward; and always twirling, twirling, twirling". Cause when I'm twirling, that's when the red goes green. Holy crapola, I can't believe it went from that red, to the below green. This is the kind of pigment I believe is used in Clarins 230 and Liquid Euphoria Bliss. Now I made my franken really saturated because I wanted a full nail colour, whereas those polishes have a much more subtle colour changing sparkle, but that just depends on how much powder you put in. Another spectacular video demonstrating my outstanding videography skills. Here are my bottles pics of each of these frankens. All I did was add less than a quarter of a gram of pigment to a bottle of regular clear nail polish. As you can see these end up being a milky translucent polish. 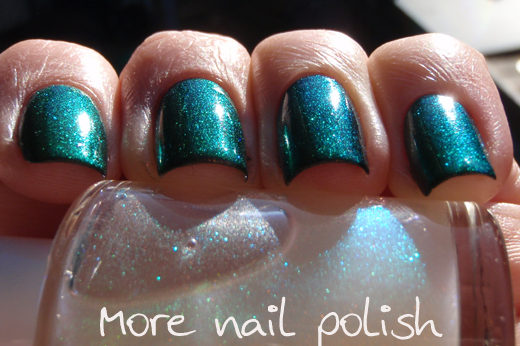 If using regular clear nail polish (and not a suspension base) then it will settle to the bottom after about 3-4 days. However I have found that these mix up a lot easier than glitter or spectraflair and you only need to re shake the bottle for a few minutes to use it again. 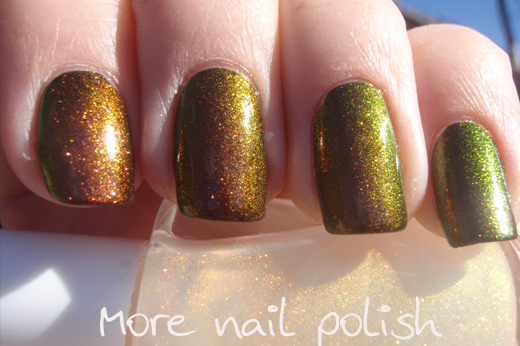 Ok, so now the fun bit about how you can get your hands on some of this pigment. I was only able to buy this stuff in fairly large quantities, so I'm on selling the stuff I don't need. Its chameleon colour changing pigment, used in the automotive industry for car paints as well as manufacturing of plastics etc. The particle size is 90 microns, which is larger than spectraflair, but smaller than ultra fine .004" glitter. Mixed in nail polish it is totally smooth, no top coat required. Where did I get it from? I purchased two different brands from two places. All three colours, Gold to Green, Copper Red to Green and Violet Blue to green, are Konfusion brand. You can buy a half ounce tub from The coating store in the US for $45. But a half ounce is a lot of pigment when you talking a few bottles of nail polish. That’s why I’m keeping some for myself to continue frankening with, but splitting up the rest to sell to you guys. 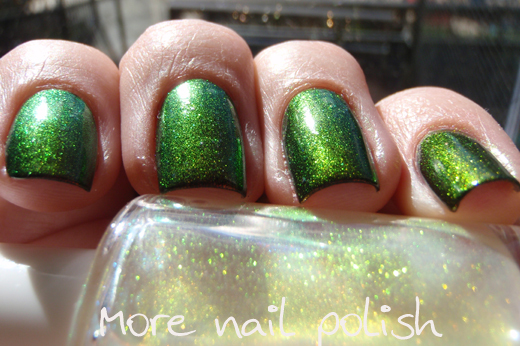 Before I bought the Konfusion brand pigments, I actually bought a two ounce tub of House of Kolor chameleon powder in Gold to green from an Australian seller on ebay who had bought it to paint their car, and changed their mind. This tub retails on the House of Kolor Australian website for $755.92!! Is it safe to use car pigment in nail polish? It is not cosmetic grade for use in other makeup, however suspended in nail polish it all seems fine. I have had mine mixed for several weeks and they are still perfect. No cracked bottles, no explosions, no fingers or nails falling off. 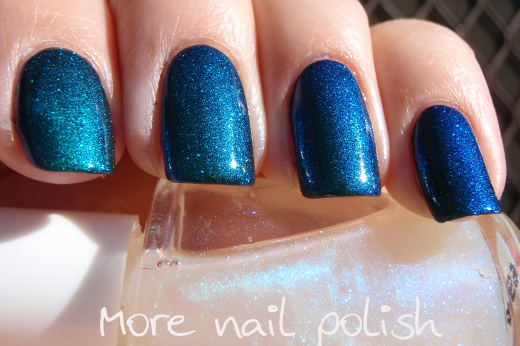 All nail polish contains pigments etc, and these colour changing pigments can only be created a specific way. Given that these types of effects have been seen in nail polishes before (eg Clarins 230, Liquid Euphoria etc) I suspect these pigments have been used in the manufacturing process before. However, if you have any concerns, do not purchase it. And I also don't want to hear from people bitching that I am using it and selling what I wont use. I will combine up to three pots (one of each colour) for the same postage. What will you get if you buy some? I purchased some digital precision jewellery scales so I can accurately measure out one gram. The scales measure down to .01 of a gram. I also purchased some little 3 gram cosmetic pots to put the pigment in, rather than sending it to you in zip lock bags. While placing the pigment in ziplock bags would be easier for me to do, I find it difficult to get pigment out of them without creating a mess. When you open the zip, powder often puffs up into the air. I think this creates a greater risk on inhalation as well of being wasteful. Whereas in the pots, you can leave it to settle, then gently open the pot, easily scoop some out and then do up the pot without powder going everywhere. So you will get one gram of your choice of pigment powder in a nice little cosmetic pot. Here is a picture of some I have packaged up already. How many bottles of polish will one gram make? Of course this depends on the size of your bottles and how saturated you want the pigment. Do you want to make it a one coater or just a light flash of colour changing sparkle? I made the above bottles up, which are 13.5ml, using less than a quarter of a gram. I think mine are very saturated, but make your own mind up looking at the pictures. How do you make a Franken polish with this? 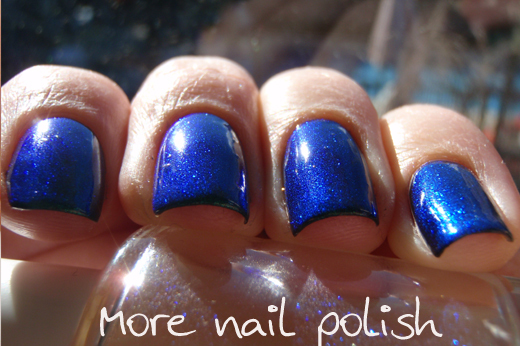 If you just want a simple layering top coat, all you have to do is mix it with a clear polish. 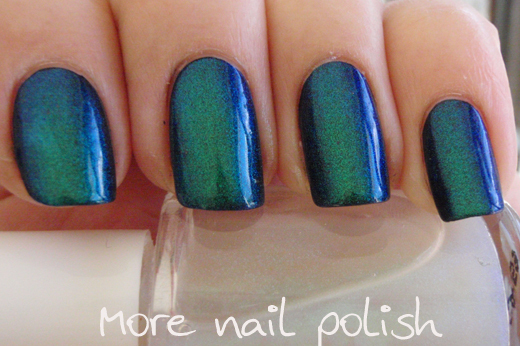 Start with a little bit, then shake, and swatch it onto a black or dark base. Keep adding pigment until you get the desired opacity. Using a clear polish will mean it will settle after a few days. If you use a very sheer French colour or other sheer shimmer polish as the base, it will generally hold the pigment in suspension. Clarins 230 – A sheer maroon purple base with copper red to green pigment. 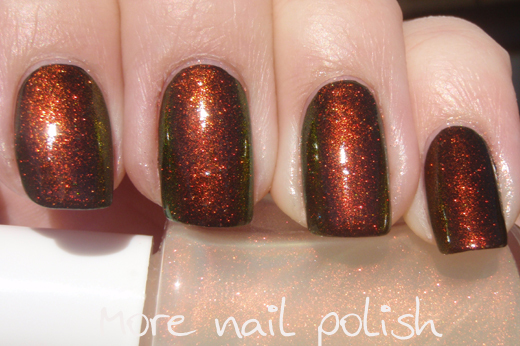 Liquid Euphoria Bliss – A sheer purpley/maroon base with copper red to green pigment. Check out a swatch here. 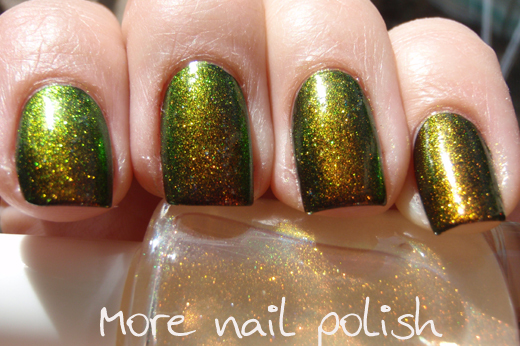 Liquid Euphoria Dreamy – A sheer greenish jelly with gold to green pigment. Check out a swatch here. Liquid Euphoria Euphoric - A sheer purple jelly base with Violet blue to green pigment. Check out a swatch here. 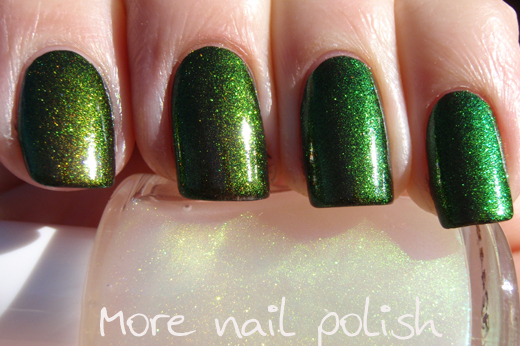 Send me an email to morenailpolish@iinet.net.au and tell me what colour/s you want. I will then confirm that I have enough stock for your requested colour/s and send you all the details of how to pay in an email back to you. Because of the outrageous PayPal fees, I will be asking you to send your PayPal payment as a "Personal" amount of "Payment owed", rather than sending money as "Purchase of goods". I will also ask people, where possible, to please use funds from a bank account or PayPal credit, rather than using their credit card. I still get charged fees for all international transactions but doing the above two things helps to lower the percentage they take. How much profit am I making? After taking all costs into account (specifically PayPal fees) I’m making about a buck fifty for each lot, which I think is reasonable for the hours (upon hours) of time and effort involved in packaging and posting. Why not sell through ebay? It costs too much! I just want to share the awesomeness of these powders so others can have some fun like me. If I were to sell through ebay I would have to pay insertion fees, final value fees and full commercial PayPal fees, plus spend more of my time to make eBay listings. However if that is what people want (so they can receive PayPal buyer protection) I am happy to do it. But the eBay price will be AUD$8.00 per gram. I will create individual custom listings for people who want this. I'll then email you the ebay item listing. I just want to do this as cheaply as possible for everyone, so you can experience this fun with nail polish. What if it doesn’t arrive? I will take photos of every order I send off to prove I have done it. If the item is lost in the post (and I addressed the envelope correctly) I can’t take responsibility for that. Sorry. If this is a concern for you, I’m happy to do registered post, although that costs $13.20 which you will have to pay. If my photo shows I sent it to the wrong address, I will resend. I'm happy for you to ask any questions in the comments, or if you would rather send them by email you can to morenailpolish@iinet.net.au. WOW, so there you have it. I'm exhausted. O. M. G......Emailing you now!!! Mind blowing stuff - I'm next in line!!!!!!!!!! Thank you so much for linking to my blog! :) I emailed you as well, I can post a comparison of dreamy with the pigment. I think I'll be getting in the line too! Oh my goodness, these are STUNNING. UPDATE - I just got back from lunch to find a rather full inbox. Don't panic everyone. I'm out of the red/green and blue/green, BUT I have just ordered a two once tub of each, which means I have plenty of every colour for everyone. It just might take a week or two to get them to you. Also, I'm processing them in order of emails received. Now that I know people are interested in it, I don't mind spending the $$ upfront so everyone who wants it can get it cheaply. I love your blog! Thanks for posting about this! I'm sure your inbox was stuffed, this post got linked over on MUA's Nail Board :) We're all freaking out a little bit :) I sent you an email also but I was hoping to get one of each color for myself and if you have a lot of extra, another set for my sister. I would be willing to pay twice the shipping of course. If your quantities are limited, I don't want to be greedy so my sister and I can share one set so that everybody else has the opportunity to get some too. Thank you so so so much for doing this. This is amazing!! Thank you so so so much for doing this. I'm so excited about this. Also, this is the first time I've visited your blog and I love it. They're amazing! I'm not into crafting ATM (don't want the baby inhale anything suspicious) BUT I sure hope someone would whip up extra bottles of these frankens so I could purchase them readily made? UPDATE - Ok, 75+ emails later, I feel a bit more under control. If you emailed, and I haven't replied, please email me again. STOCK - If everyone who sent an email pays, then I will have used up all the stock - including the new stock I ordered today! I'm happy to order more, but I just want to wait until I get some more payments through. So far 25 have paid, but I don't want to order more if the payments don't actually come through. So the later you pay, the longer you may have to wait. Wow, clever girl, frankens are gorgous, think i'll also be in the queue, just need to work out 3 pots plus postage from AUS $ to UK £. Thanks for sharing, oh my you're popular!!! Barely alive Claire - and I've been wearing the same mani for three days!! 120 orders and 69 payments so far. I've sent off my second order for more powder and ordered more little jars. I've haven't got around to shipping the first lot yet, but I plan to package and address them tonight. Man, I haven't even had time to do blog surfing. I'll have a lot of catching up to do. Oh! :o Doing some late night blog reading & so excited after reading this post. Hope it's not too late to get in on this. Should I go ahead & send you an email or wait for you to get restocked? Michelle - send your email now, that way I can include you in my spreadsheet. I'm sending pigment based on payment order. It will probably be about two weeks until I can ship again. OK, email sent. So excited & holy moly! I just watched the videos! stunning! :D I can't wait!! These are amazing! Wish I had money so I could join the queue! Good luck processing everything! My socks. D: They've been knocked off... and quite possibly not landed yet. I have two ounce bottles of each colour on their way to me, this will cover orders for ladies up to #72 on the list. The second order, which will cover ladies on the list from #73 onwards, will be slightly delayed as the Coating Store has had to order more of the Emerald Green to viola blue. They expect that to arrive with them next week and be shipped to me thereafter. These two shipments will cover all ladies that have paid to date, plus 15 out of 35 of the remaining orders which have not yet been paid for. Only once all of the new stock is gone will I order more, so the later you pay, the longer you will wait. I'd also love to be able to buy some of these powders.. Is it too late to join the queue? Will you ship to the US? And if so, at what additional cost? Ferretkingdon - Yes to worldwide shipping, that includes the USA, no additional cost. $2.50 Anywhere. The ultra fine .004 glitter is 101.6 micros. So only a little larger. 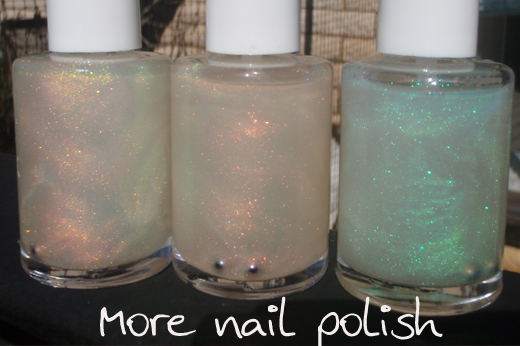 But these are totally smooth, whereas polishes I've made with the glitter still feel gritty. Maybe these colour morphing powders are thinner than the glitter even though they are cut to very similar sizes. Azazella - Of course, as long as you don't mind waiting a few weeks. I have ordered more of each colour, and they should be here by the end of September. it's not a problem :D i'm mailing you right now! Wonderful! Thanks for all the info. Plus the Simpson's reference was perfectly executed. Have you ever experienced using these powders in gel polishes like Gelish or Artistic Colour Gloss? 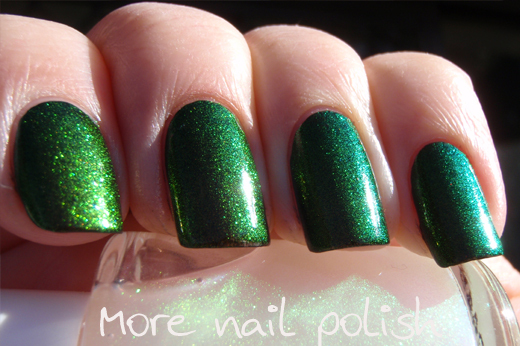 katnalex - no I have never used gel polishes, but I am confident that they would work well. I.Need.All.Three + the Spectraflair! GAH!!! just recently found your blog and am amazed at the colours you have made! will be funding my PayPal account and emailing you... hoping that you still have enough pigments left [and secretly hoping someone hasn't paid!]. can't thank you enough for finding these for us nail polish junkies & fiends and the time it takes you to measure everything out and post! The colours you've shown here are absolutely gorgey, and I'd love to be able to wear something like it - but just about everything you wrote above went over my head (except probably the Kang reference... I got that :D) so I'm wondering, since we both live in Canberra, would it be cool if you made up bottles for me like you did above for yourself? I'd ofc pay you (Whether with cash or through paypal or bank/bank transfer whichever you prefer) something you think and I agree is reasonable and/or provide you with other materials you need. Asajii - are you serious, your in Canberra, I think your my first reader that I have found that is in Canberra. I will absolutely make some bottles for you. Send me an email to morenailpolish@iinet.net.au and we can work something out. I just got mine!! :D i'm soooo happy! i bet they will be awesome! Does this work with gel? Do you still have these pigments or know where I can get them? Firstly, thank you for being so thorough in your cataloging of Ulta3 colours, your site has been INVALUABLE to me when purchasing online. I am shocked that I have only now come across this post from 2011, and am wondering if you still have any pots available? Hi there! I was wondering if you could share what number chameleon powders these are from the Color Store? they have them numbered from 1 through 10 and I can't seem to match them with what you have here... Thanks for such a great post! Hi, honestly I don't think these are the same product any more after 5+ years. Looking at those ten colours, they don't have the same sparkle that these old powders have, these look more like all the other chameleon multichrome powders currently available. Sorry, but I've been searching all over the internet and have no idea where these powders are still available. Can you sell me a bottle with all three mixed together? I have a bottle of Clarins230 and it shifts from more than red to green so I bet it they were all mixed you could get close to the same effect. I would be happy to swatch my clarins with your polish if you can mix it that way. Could you email me at awwburreee@gmail.com so I could purchase this?